2. Choose a child (If you have not already chosen a child, we will email you list of children who still need sponsors). 3. Begin changing a life! House of Joy, our children’s home, was established in 2001 as a home for orphaned, abandoned and at-risk Akha children in Northern Thailand. We provide for their physical, educational and emotional needs while seeking to cultivate within them a love for God and a passion for serving others, especially their own people. Your contribution is not only an investment in the Kingdom of Heaven, but also in the future of the Akha people. 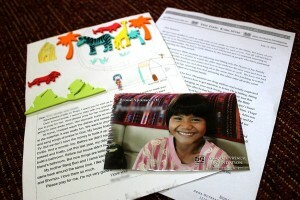 As a sponsor, you’ll receive a personal letter from your child twice a year, along with a recent photo of him or her. In addition, you can send pictures and letters/emails which we will translate for your child. Pictures of sponsors’ families are cherished by our children and often find a prominent place in their lockers. Several sponsors have made the trip here to meet their child in person. Three sponsors contribute US$40 a month per child. 100% goes directly toward operating expenses for the organization. This includes food, education, transportation, medical needs, maintenance, administration, staff salaries, utilities, travel, Bible training, and annual events.